The PATHWAY Study Programme Manager, Lora Capobianco and Public Involvement Lead, Lyndsey Brown, will be presenting at Pint of Science Festival 20-22 May 2019. They will be presenting ‘Thinking about Thinking; a new approach to cardiac rehab’. They will cover a number of things including Patient and public involvement in MCT Pathway, what does this therapy look like? Why do we think it may be more effective than current techniques? And how have our advisory group helped to ensure that these trials are as effective as possible? Exciting times as the WS3 Feasibility trial is now being extended . We will have 138 patients to recruit from Bolton, Liverpool, Macclesfield and Pennine Hospital. 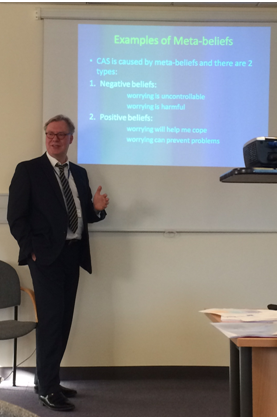 PATHWAY are committed to improving Mental health for patients following a cardiac event! A massive thank you to all of our patients for their continued support on The PATHWAY Study, your support makes a difference in Mental Health! We really appreciate the time and effort taken to complete follow ups, your answers and thoughts are vital in improving Mental Health for patients following a Cardiac event! We have now reached the end of 12 month follow up for WS2 following a tremendous return rate of 87% for 4 month follow up. We continue to collect 12 month follow up questionnaires for WS3! It’s Time to Talk day where everyone is encouraged to talk about Mental Health. 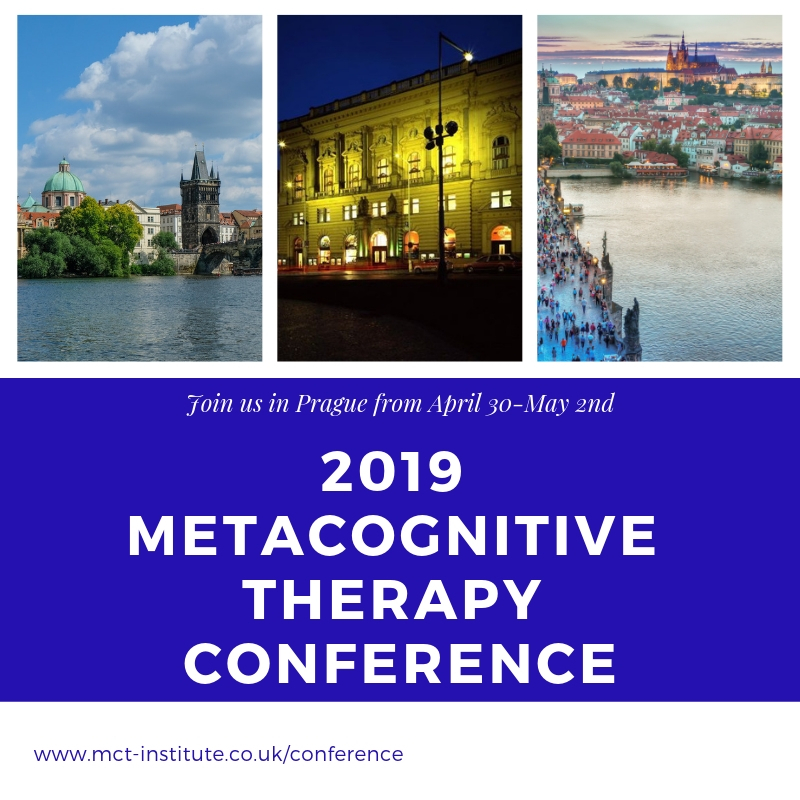 Exciting times ahead as the 4th International Metacognitive therapy Conference will be held on April 30th-May 2nd, Prague. Presenting the latest development in Metacognitive Therapy and its applications. A MASSIVE THANK YOU to all of our patients for their continued support on The PATHWAY Study, we really appreciate the time and efforts you take to complete follow up questionnaires. Every question you answer makes a difference in Mental Health for patients who have been through a cardiac event. We continue to have a strong follow up rate with our 12 month follow up rate at 85% for WS2 and 94% for WS3. Every questionnaire returned makes a difference and will help to improve the effectiveness of treatment following a cardiac event! We recently published an article in Frontiers in Psychology, evaluating emotional distress in cardiac patients. We compared how cognitive behavioural therapy (CBT) and metacognitive therapy (MCT) models conceptualize cardiac patients, anxiety and depression and explored why CBT has limited benefits for cardiac patient and if MCT has the potential to be more effective. We found that one of the difficulties with CBT is identifying thoughts as unrealistic or not, where thoughts about disease, death or disability may not be amendable to classic CBT techniques such as reality testing. MCT proved to be simpler, and because it did not distinguish between realistic and unrealistic thoughts, may prove to be a better fit to emotional distress in cardiac patients. During this month, interviews were conducted by Carolyn Gamble with two members of our Patient and Public Advisory group, Christina Barker and Jim Clough. Be sure to check out the video of the interviews on the Patient and Public Advisory Group page. A BIG THANK YOU to all of our patients for their continued support on The PATHWAY Study, we really appreciate the time and effort you take to complete follow up questionnaires. Following our strong follow up rate at 4 month follow up for WS2 and WS3, we continue to have a strong follow up rate at 12 month follow up! Our 12 month follow up rate is 84% for WS2 and 91% for WS3. We met with our patient and public advisory group to discuss dissemination and lots of other exciting things we have planned! A BIG THANK YOU to Carolyn Gamble for all her hard work with our patient and public advisory group, we wish you the best of luck for the future! A warm welcome to Lindsey Brown, who will be the patient and public involvement lead. A HUGE THANK YOU to our amazing cardiac rehabilitation nurses! Thank you very much to our nurses from Aintree Liverpool Hospital: Sonia Murphy, Michelle Kerr, Mary Torpey and Andrea Connelly. Thank you very much to our nurses from Bolton Hospital: Jo Varker, Jo Evans and Sally-Ann Fitzsimmons. WS3 wouldn’t have been possible without you! You have done a fantastic job! Thanks again for your continued commitment and hard work! It was great to have you all here and know more about your experiences of delivering Home-MCT telephone calls and it has been an incredible opportunity to learn from your experience of being involved in the WS3 Pathway project. It is a pleasure to work with you all! Congratulations team! The protocol for WS3 has been published! If you're interested in reading more about our home-based manual of MCT for cardiac rehabilitation patients click here! A BIG thank you to all of our patients for our excellent job on returning follow up questionnaires. Four month follow up is now completed for both WS2 and WS3 ! Our WS2 four month follow up rate was 87% and WS3 was 90%! We continue to have a strong follow up rate at 12 month follow up, which is 83% for WS2 and 80% for WS3. We also recently published a commentary on Metacognitive Therapy for Anxiety and Depression in Cardiac Rehabilitation. Click here to read the article. We would like to continue to thank our patients for all their continued support on the PATHWAY study. We've continued our strong follow up rate from month to month. For WS2 we have had a great rate of return on the four month follow up questionnaires at 86%, and 79% at twelve month follow up. WS3 also has an excellent rate of return for follow up rate with a 90% rate of return at four month follow up, and 77% at twelve month follow up! Thank you to all of our patients for continuing to complete the questionnaires, all of the information returned will help to improve cardiac care in the future! We met with our CR nurses who delivered MCT in the study to get further feedback on their views of delivering MCT and update them on the progress of the study! We met with our patient and public advisory group to start planning how we can disseminate the results of the study. We have some very exciting plans coming so stay tuned! We attended patients day with some of our advisory group members. Its fantastic to see patients being integrated into research conferences! So many interesting patient stories, we cant wait to go back next year! PATHWAY Team Sr. Research Assistant, Dr. Lora Capobianco, and PATHWAY Patient and Public Advisory Team member, Christine Barker gave a talk on Mental Health Awareness and Mental Health Research. Well done to Christine, who did an excellent job sharing her experiencing with mental health following a cardiac event and her involvement with the PATHWAY study! We've sent out newsletters to all of our patients who have completed their first set of follow up questionnaires to update them on the progress of the study! 28th March 2018- Thank you for your continued support! The team is hard at work collecting follow up questionnaires from our patients! Every questionnaire will help to improve the effectiveness of treatment and to help us understand more about how people feel after having a cardiac event! 28th February 2018- Congratulations team! WS3 has finished recruitment! CONGRATULATIONS and a massive THANK YOU to our WS3 sites (Bolton Hospital and Aintree Liverpool) We were able to hit our recruitment target of 108 participants in 10 months! Thank you very much for your continued support and commitment to the study! 30th January 2018 - Well done team! WS2 has finished recruitment! Combining WS1 and WS2 participants we have achieved our recruitment target of 332 participants! CONGRATULATIONS and massive THANKS to all of our WS1 and WS2 recruitment sites! Thank you very much for your continued involvement in the trial! THANK YOU VERY MUCH to CMFT, UHSM, MDGH, Pennine and Stockport, we very much appreciate all your hard work and effort over these years! Regarding WS3, we have only 2 participants left to recruit to meet our target! We are really close to ending recruitment! Very well done to Aintree Liverpool and Bolton Hospital, in 10 months you have recruited over 100 participants! Massive congratulations and thank you very much for your commitment! 22nd December 2017 - The Pathway team would like to wish you all a happy and peaceful Christmas and all the very best for the New Year! Thank you for all your consistent hard work and support over 2017. We very much appreciate the dedication and commitment to the trial! Count down for recruitment! Only 4 more patients to be recruited for WS2 and 7 patients for WS3! You have all done a fantastic work! 30th November 2017 - An excellent months for the PATHWAY trial! Many thanks to all the sites for their hard work and consistent effort! We have recruited 271 patients for WS2, meaning that we are in the final countdown! Only 9 more patients to be recruited! We have recruited 92 patients for WS3, only 16 more to recruit! 31st October 2017 - Another great month for recruitment across all the sites! Massive thanks to all the sites for their continuous commitment and dedication! We have recruited 253 patients for WS2, well done to all the sites! Only 27 more to recruit! We have recruited 81 patients for WS3, congratulations to both sites taking part in WS3! Only 27 more to recruit! 10th October 2017- Recruitment is going really well! We are very close to reach our recruitment target, only 41 more patients left to be recruited! Congratulations to all the sites for their excellent work! We have recruited 239 patients for WS2. Thanks a lot to all the sites for the continuous effort and commitment! We have recruited 70 patients so far for WS3. Massive congratulations to our two sites! Many thanks for your consistent dedication over the last 7 months! Note: The target sample size has been revised based on a 70% rate of return at 4 months follow up; the target sample size is now 332. 18th September 2017- We attended the 2017 European Association of Behavioural and Cognitive Therapy (EABCT) Conference. It was an exciting few days of workshops, keynotes and symposiums! Prof. Adrian Wells gave an excellent keynote presentation which evaluated if Metacognitive Therapy is more effective than other evidence based therapies. 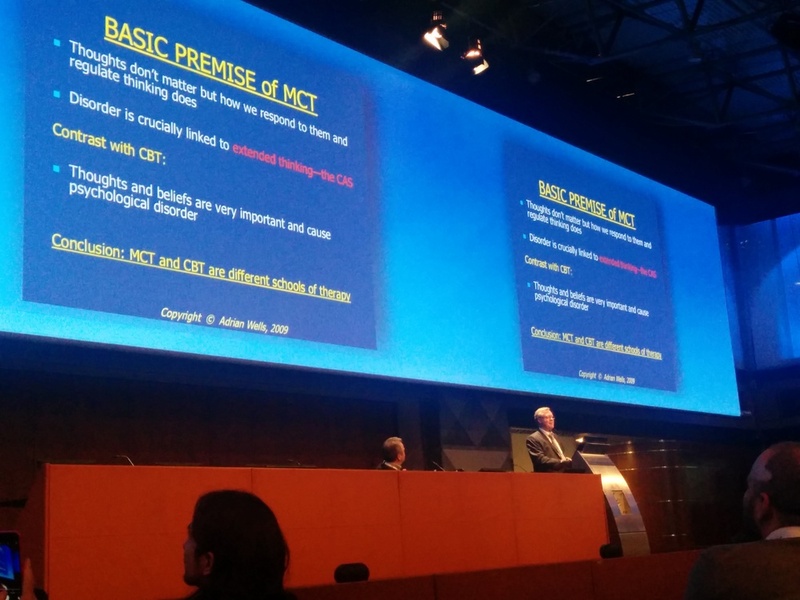 Very exciting and promising results on the Efficacy of MCT! Dr. Peter Fisher and Prof. Adrian Wells also presented on the PATHWAY study. Dr. Fisher presented on conceptualizing cardiac rehabilitation patients distress using cognitive behavioural therapy and metacognitive therapy and Prof. Adrian Wells presented evaluating if metacognitive beliefs are transdiagnostic: a comparison of cancer and cardiac patient experiencing anxiety and depression. 31st August 2017 - This was another busy month for the PATHWAY Team! Congratulations to all our sites for their consistent commitment! We have recruited 19 patients for WS2 across the five sites! We have 216 patients as part of WS2. Well done to all the staff! And thank you very much! WS3 has been busy too! We have recruited 14 patients across two sites! Massive congratulations to all the staff from the sites, we have 60 patients as part of WS3! 31st July 2017 - Congratulations to all the sites recruiting patients for WS2!! This month we have recruited 17 patients, so we have a total of 199 patients for WS2 so far. This was another busy month for WS3! Well done to Aintree Liverpool and Bolton Hospital! We have recruited 15 patients this month and we have 46 patients so far. Thank you to all the sites for your continued commitment and dedication to the trial! Well done to our WS2 sites! This month we recruited 22 patients!! We have now recruited 180 patients for WS2! Thank you for your continued support and dedication to the trial! WS3 has had quite a busy month! We have recruited 31 patients so far! What a fantastic start, seeing that recruitment only started 3 months ago!! Well done to Bolton and Aintree Liverpool for your hard work and dedication! 5-7th June 2017 - Rebecca Anderson (PATHWAY Senior Research Assistant) attended the British Cardiovascular Society Annual Conference and presented on Metacognitive Therapy and cardiac rehabilitation. Rebecca stated that the conference was very interesting and focused on a variety of topics. For more highlights from the conference check out @mctpathway on Twitter. 26th May 2017 - Massive congratulations to our recruiting sites for WS2. In May we have recruited 21 patients!! We have 153 patients recruited for WS2 so far. Many thanks to everyone for your commitment and dedication to the trial. Well done Bolton and Aintree Liverpool! We have opened the recruitment less than 2 months ago and we have recruited 15 patients into WS3 which is a fantastic start! Massive thanks for everything you are doing for the trial, we very much appreciate the effort and dedication. 28th April 2017 - In April 9 patients have been recruited for WS2 and 5 patients for WS3. Please see details on the table below. 25th April 2017 - Thank you to the Cardiac Rehab staff from WS2 sites for attending the MCT boosting training session. We are grateful for your commitment to learning and development in your understanding and delivering of Group-MCT. 13th April 2017 - We have recruited 12 more patients to the trial this month! See details on the table below. 4th April 2017 - Recruitment is now open for WS3! 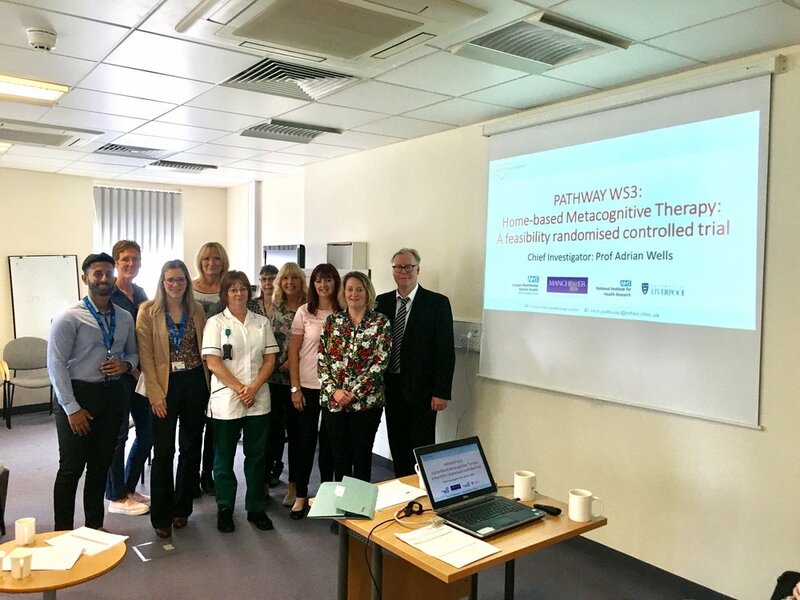 Thanks a lot to Aintree University Hospital NHS Trust and Bolton NHS Trust for all your hard work, enthusiasm and commitment to WS3. We wish you all the success in your first month recruiting for the last Work-Stream of the PATHWAY Programme! 28th February 2017 - We have recruited 12 more patients to the trial this month! See details on the table below. 6th February 2017 - Thank you to the CR staff from Bolton NHS Trust and Aintree University Hospital for completing their second day of training for WS3. Well done! Now we are nearly ready to start the recruitment for WS3! 31st January 2017- Well done for the CR pathway recruitment sites! We have recruited 22 patients this month! This is our best month so far! Thanks a lot to everyone for the effort and commitment! This is a great start for 2017! See table below. 26th January 2017 - We have conducted a focus group to explore the views of our PPI members regarding the Home-Metacognitive intervention (manual + telephone calls) before starting WS3. Thanks a lot to our PPI group for their commitment and valuable feedback! 20th January 2017 - Another busy month for the Pathway team! 13 patients recruited this month! 13th January 2017 - We have received HRA approval for WS3. 2nd January till 20th January 2017- A pilot study was conducted with our PPI group as part of WS3. The pilot study was aimed to explore the Home-based Metacognitive intervention (manual + telephone calls) before starting the feasibility trial. 22nd December 2016- The Pathway team would like to wish you all a happy and peaceful Christmas and best wishes for the New Year. Thank you for all your hard work and support over the past 12 months. We look forward to our continued collaboration in 2017! 22nd December 2016 - We have now recruited 134 participants to the Pathway study; thank you to everyone for helping us get this far! 13th December 2016 - Thanks to the PPI group for their invaluable input to the PATHWAY Research. We are excited to pilot WS3 with six of our PPI members. Many thanks to Jim C, Chris, Marie, Jerry, Christine, Jim S for being on board. Many thanks to Carolyn, the PPI leader for her constant support and engagement to work closely with PPI at different stages of our research. 2nd December 2016 - We have recruited 127 participants to the Pathway study - see table below. Congratulations to Pennine for recruiting their first 2 patients last month! Congratulations to Stockport for recruiting their first patient within a week of opening as a site! Congratulations also to CMFT, UHSM and MDGH for all the patients recruited over this year! 30th November 2016 - Thank you to Maureen and Janet from Stockport NHS Foundation Trust for attending their second Group-MCT training day. 28th November 2016 - Thank you to Joanne, Joanna and Sallyann from Bolton NHS Trust and to Sonia, Mary, Michelle and Andrea from Aintree University Hospital for attending their first Home-MCT training day. Welcome to the Pathway team! We are very pleased to have you on board for WS3. 31st October 2016 - We have reached 120 recruits to the Pathway study - see table below. 30th September 2016 - We have reached 115 recruits to the Pathway study - see table below. 21st September 2016 - Research Seminar on the Pathway Study at the Rawnsley Building, Manchester Royal Infirmary. Thanks to all the attendees! 13th September 2016 - Please join us for our Research Seminar on the Pathway Study on Wednesday 21st September 1-2pm, Conference Room, Rawnsley Building, Manchester Royal Infirmary. Two of our Research Assistants will be presenting - Dr Rebecca McPhillips & Rebecca Anderson. Please click here to find out more and book. 31st August 2016 - The Pathway study now has 105 patients recruited (please see table below). We recruited 52 patients to the pilot study (WS1) and now have 53 patients recruited so far to the main trial (WS2). 10th August 2016 - Thank you to Maureen and Janet from Stockport NHS Foundation Trust for attending their first Group-MCT training day. We are very pleased to be welcoming them to the Pathway team. 1st August 2016 - The Pathway study now has 96 patients recruited (please see table below). We recruited 52 patients to the pilot study (WS1) and now have 44 patients recruited so far to the main trial (WS2). 26th July 2016 - Sarah Alvi our research volunteer will be leaving the team today. We wish her the very best of luck with her degree in Medicine which she starts in September 2016 at the University of St Andrews. She has been a great asset to the team and has an excellent work ethic. Thank you Sarah, you will be missed! 12th July 2016 - We welcome our new Patient and Public Involvement lead for the Pathway Study - Carolyn Gamble - her biography can be found here on the 'Meet The Team' page. 12th July 2016 - Thank you to our Patient and Public Involvement (PPI) Group for their excellent input into the economic work on the Pathway study. Also, a massive thank you to Tracey Williamson for all of her valuable input on the PPI work for the Pathway study and very best wishes for her future projects. 11th July 2016 - A great first Group-MCT training day with one of our new sites - Pennine Acute Hospitals NHS Trust. A big thank you to Paula and Sue for their hard work and welcome to the Pathway team! 1st July 2016 - The Pathway study now has 87 patients recruited (please see table below). We recruited 52 patients to the pilot study (WS1) and now have 35 patients recruited so far to the main trial (WS2). 1st June 2016 - Helen Morley (Senior Research Assistant) made every heart beat count by completing the British Heart Foundation "My Marathon" in May 2016 raising a brilliant amount for the charity. If you would still like to donate please visit her sponsorship page here. Helen Morley (Senior Research Assistant) from the Pathway team ran 26.2 miles in May 2016 to complete the British Heart Foundation "My Marathon" and raised a fantastic £53.24 for the charity! Well done Helen!! 31st May 2016 - The Pathway study now has 79 patients recruited (please see table below). We recruited 52 patients to the pilot study (WS1) and now have 27 patients recruited so far to the main trial (WS2). 31st May 2016 - We have a produced a summary of the work each of the three sites have done on the Pathway study so far which you can see below. 29th April 2016 - The Pathway study now has 71 patients recruited (please see table below). We recruited 52 patients to the pilot study (WS1) and now have 19 patients recruited so far to the main trial (WS2). 8th -9th April 2016 - The Pathway study presented at The 3rd International Conference Metacognitive Therapy at the Palazzo Mezzanotte in Milan. 31st March 2016 - The Pathway study now has 62 patients recruited (please see table below). We recruited 52 patients to the pilot study (WS1) and now have 10 patients recruited so far to the main trial (WS2). 14th March 2016 - A new report by the Kings Fund shows that "the psychological problems associated with physical health condutions and vice versa are costing the NHS more that £11 billion a year and care is less effective than it could be". The report emphasises the importance of treating the whole person by managing physical and mental health problems in an integrated way which could improve health outcomes and save the NHS money. Please click here to find out more. 9th February 2016 - Today we reached our Pathway pilot study target of 50 patients! Congratulations to the team, all of our site therapists for their continued hard work and importantly the patients who have agreed to take part for helping us to achieve this milestone. 29th January 2016 - The Pathway study now has 45 patients recruited (please see table below) - That's five patients recruited in a week! 21st January 2016 - The Pathway study now has 40 patients recruited (please see table below) - a great start to the New Year with only 10 patients left to recruit for the pilot study! 24th December 2015 - The Pathway study now has 34 patients recruited (please see table below). 14th December 2015 - A great Group-MCT training day with our site practitioners. 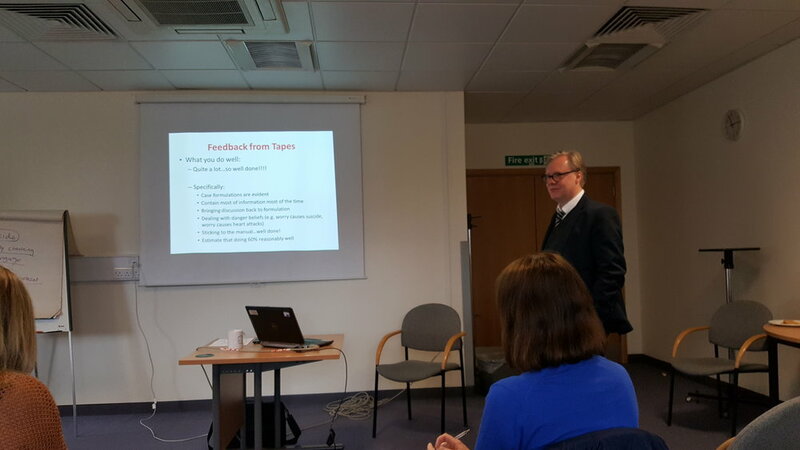 Thank you everyone for your feedback on the delivery of the Group-MCT sessions as part of the Pathway pilot study. 30th November 2015 - The Pathway study now has 29 patients recruited (please see table below). 27th October 2015 - The Pathway study now has 24 patients recruited (please see table below). 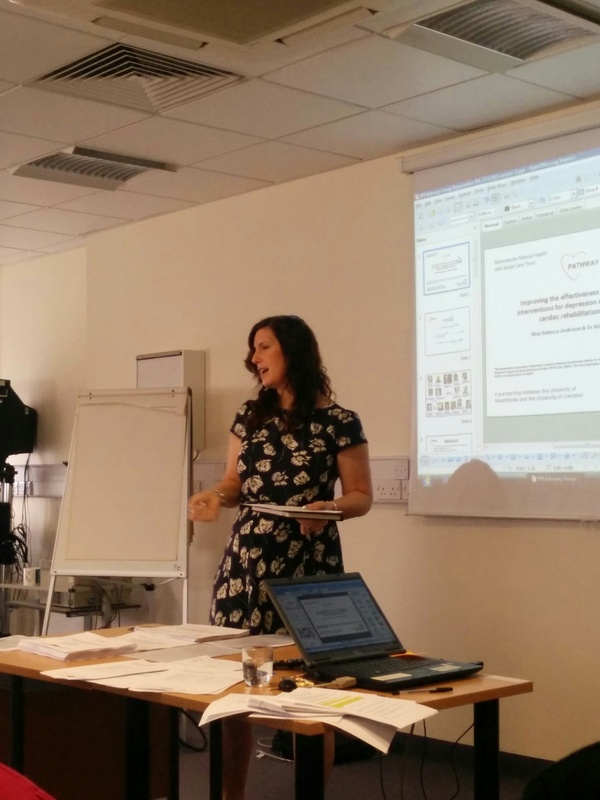 20th October 2015 - Rebecca Anderson has written our first Pathway Newsletter. We have distributed to the sites to display in their cardiac services departments. We hope that in this way we can continue to increase our communication with all of the sites and promote the site staff's hard work on the Pathway study. 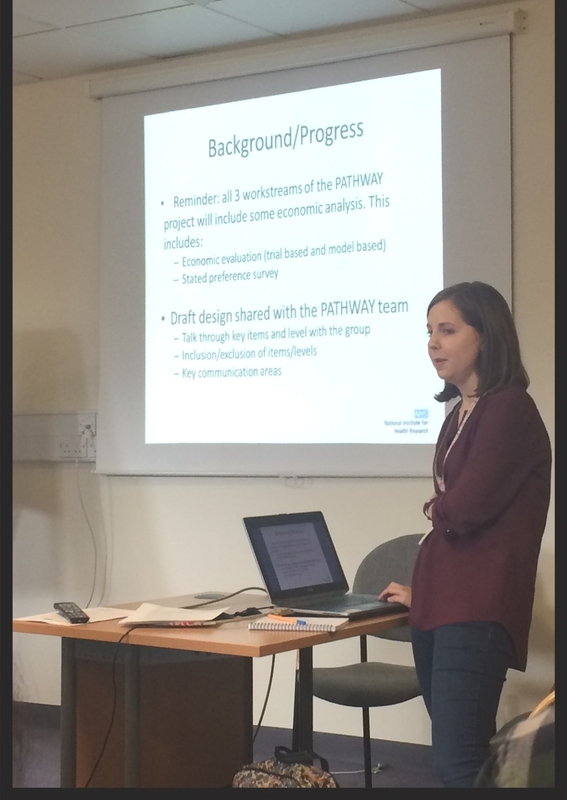 2nd October 2015 - Dr Rebecca McPhillips (Senior Research Assistant on the Pathway study) presented at the Annual BACPR conference in Manchester. 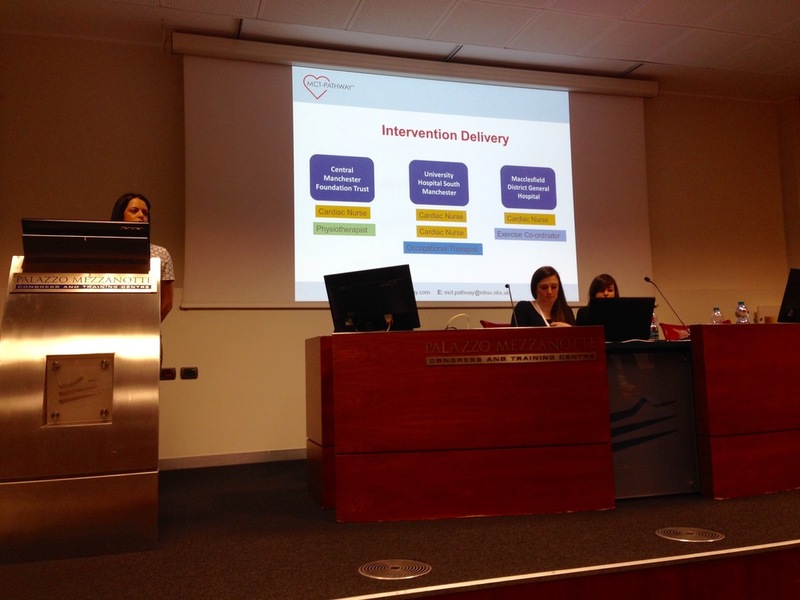 Her talk entitled "Integrating psychological care into cardiac rehabilitation pathways: the pathway trial" was well received - well done Rebecca! You can find her conference abstract on page 36 of the conference programme HERE. 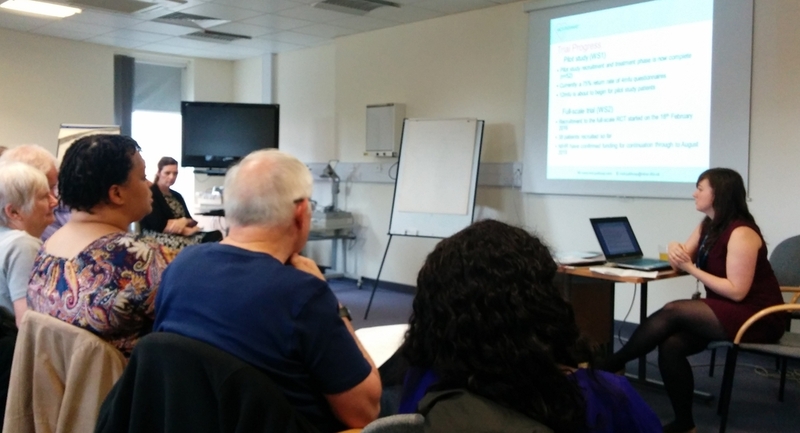 28th September 2015 - The Pathway team conducted a very successful Patient and Public Involvement (PPI) Advisory Group meeting with 8 PPI adviser's in attendance. The group participated in lively discussion about Work Streams 1 and 2 and contributed to the development of the Economic Stated Preference Survey for Work Stream 3. 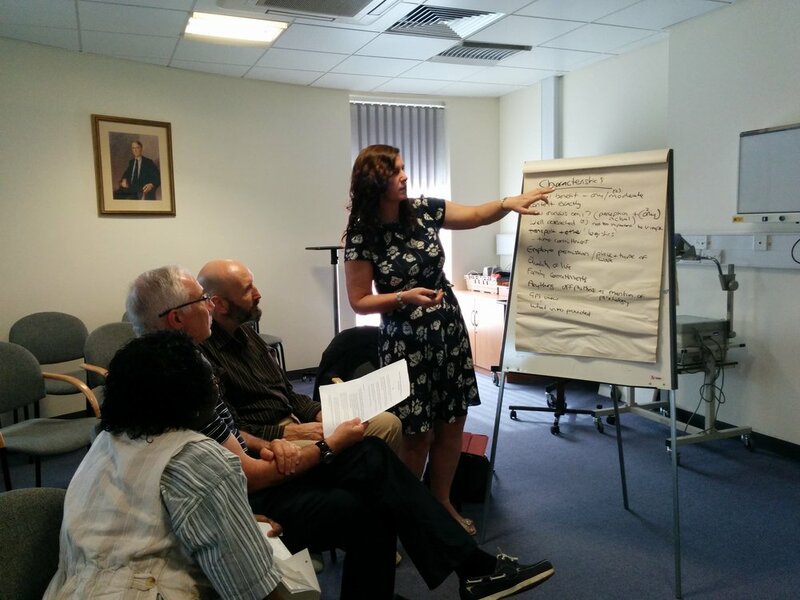 21st September 2015 - Dr Tracey Williamson, Reader in Public Involvement at the University of Salford and co-applicant on the Pathway study delivered Patient and Public Involvement Training to the Pathway Team and wider Research and Innovation Department. 26th August 2015 - The Pathway study now has 11 patients recruited (as seen in the table below) - an excellent start to recruitment by the whole team. We will continue to give short updates weekly but will also provide our overall recruitment figures on a monthly basis using the table below. 19th August 2015 - The Pathway study now has 9 patients recruited. The team also featured on the Manchester Academic Health Science Centre blog on the 14th August 2015. Please click here to read more. 12th August 2015 - We now have 6 patients recruited to the study and all sites are working hard to identify eligible patients and invite them to take part. 5th August 2015 - The Pathway study currently has 4 recruited patients with all sites actively identifying and inviting eligible patients. Well done again to the site teams at Central Manchester Foundation Trust, Macclesfield District General Hospital and University Hospital of South Manchester for all their hard work so far. 15th July 2015 - Our first patient has been recruited to the Pathway study from Central Manchester Foundation Trust (CMFT). A big thank you to Denise Gleeson and Michelle Collier at CMFT for all their efforts in identifying and inviting their first eligible patient. 13th July 2015 - All approvals for the Pathway study have now been received and recruitment is now formally open. 1st July 2015 - Dr Rebecca McPhillips and Helen Morley (pictured below) are both senior research assistants on the PATHWAY study. They presented at their old sixth form college - Holy Cross College in Bury for a careers day. Please click here for more information.